The Fine Arts Department is proposing new World Heritage sites in Thailand. The FAD is asking the United Nations Educational, Scientific and cultural Organisation (Unesco) to consider the merits of three old towns in the North, landscapes along the Chao Phraya river in Bangkok and the remnants of an ancient civilisation in the South. The sites are being pushed by Culture Minister Anusorn Wongwan. Kriengkrai Sampatcharit, an FAD official, said the three northern towns of Nan, Lamphun and Chiang Sean, in Chiang Rai province, are worthy of inclusion as they are sites of the 800-year-old Lanna civilisation and feature temples and pagodas from this era. The second region being promoted is the Chao Phraya landscape from the King Rama I Memorial bridge, near Pak Klong Talat flower market, to the King Rama VIII bridge in Bangkok. The section of the city includes national heritage sites including the Grand Palace and city landmarks including Wat Arun, the Temple of Dawn. The third nominee is the the former home of the Sri Vijaya civilisation, which reaches over the border into Malaysia. The span of the civilisation covered what is now Surat Thani, Nakhon Si Thammarat, Pattani and part of Kedah State in Malaysia. This site will have to be proposed jointly by Thailand and Malaysia. Thailand already has three world heritage sites _ Ayutthaya Historical Park, Sukhothai Historical Park and Ban Chiang, an archaeological site in the Northeast. The FAD has also already submitted some Khmer ancient sandstone structures, such as Phanom Rung stone temple in the lower Northeast, and Phu Phrabat, a park of bizarre geographical formations in Udon Thani, for Unesco listing. You might be wondering: When you think of Srivijaya, don’t you think of Indonesia rather than Thailand? The answer is yes, the polity was centred in Palembang in Sumatra, but at its height Srivijaya was thought to have another major power base in the middle of the Malay-Thai peninsula, the area shared between the Malaysian and Thai borders. 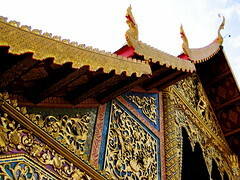 – Around Lan-Na: A Guide to Thailand’s Northern Border Region, From Chiang Mai to Nan. Yes, I think Srivijaya is more to Indonesia, than to Thailand or Malaysia. Although I have to say that even we, Indonesian, have difficulty finding more information about it as there has been very few remains being unearthed so far. I’ve been wondering why this great kingdom seemed like to have left very few for their descendants people to see? Whereas we’ve always been taught right from the elementary school that Srivijaya was once a great kingdom. Once a great kingdom left vry few for their descendant to see .Y the people of bali have more to see about their descendant arent the balinese indonesian.I guesS the answer is the religion tat ruled the kingdom last might cause the difficulty earthing information.I beleive the thais should have as it their hertige so tat future can learn tis great kingdom existed in past for sake of history.The greatest evidence n proof kingdom can be seen the religion n culture of the thais. Previous Post: Old Bangkok as part of World Heritage?